We’d love your help. Let us know what’s wrong with this preview of The Veggie Gardener's Answer Book by Barbara W. Ellis. 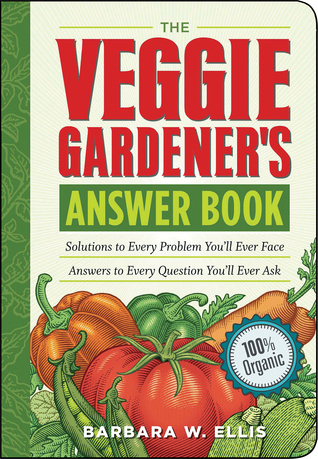 To ask other readers questions about The Veggie Gardener's Answer Book, please sign up. Excellent and pointed gardening advice. Much more straightforward than other gardening books and not trying to espouse a particular "system" or "method" (although most of her techniques are organic). Not completely comprehensive but that's too much to expect in only 400+ pages. Bottom line: Excellent resource for veggie gardeners. Very helpful to planting my veggie garden. I always have a hard time remembering what corn can't be cross-pollinated and this book had an easy way to reference that. As well as good tips on turning the soil deep enough for carrots and other root veggies to grow and quick tips on when to plant and where. I'll be scouring this again in the spring for my refresher. This book wasn't what I wanted it to be, bit what it claims to be. My hunt for the perfect veggie garden book continues.I did learn a few things but the sections on each veggie were not in depth enough for me. Very comprehensive book that tells you most everything you need to know about vegetable gardening. I particularly liked the crop by crop section, which addresses common problems with each crop. After reading this book, I felt like I knew a lot more about what was going on in my vegetable patch. This a great beginning book for novice gardeners. My daughter and I are having fun with it. Pretty excellent resource! Fact-based with enough personal accounts to be a good reference, but not dry so it's okay to read it cover to cover. I'd recommend it for a beginner gardener. I don't think it has EVERY solution but it is a good reference guide and gives some great tips on how to go from seed to sustenance! I checked this out from the library. I liked it so much that I had to buy the eBook to keep for reference! Definitely one I would like to have for reference. For a tiny book, the author covered a lot of details.